Marketers have long referred to their most interactive projects as "experiential." 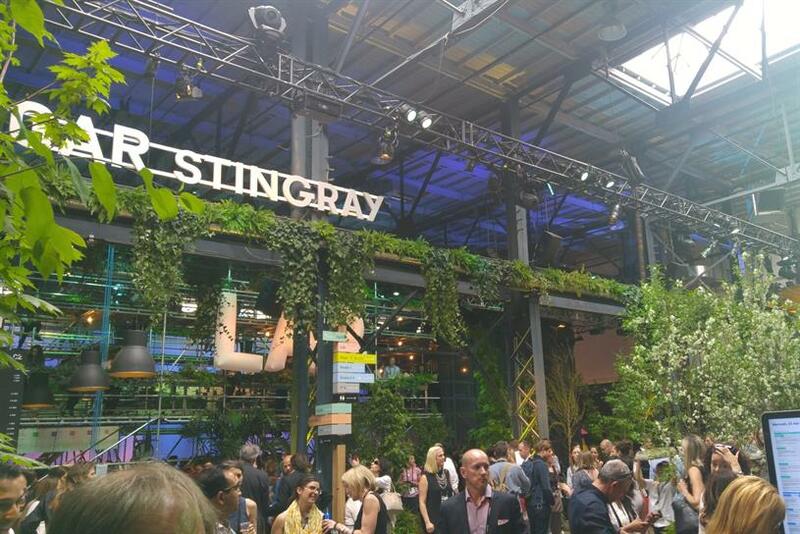 But at C2 Montreal, the entire conference was one giant activation. Not terribly surprising given that Cirque du Soleil is a founding partner. Organizers of stuffier, more traditional conferences can learn a few things from the playful activities that surrounded the business chatter. Here are the most interesting ones from last week’s conference. 1. It’s a jungle in here. This year, C2 Montreal was held at Arsenal, an art gallery downtown. 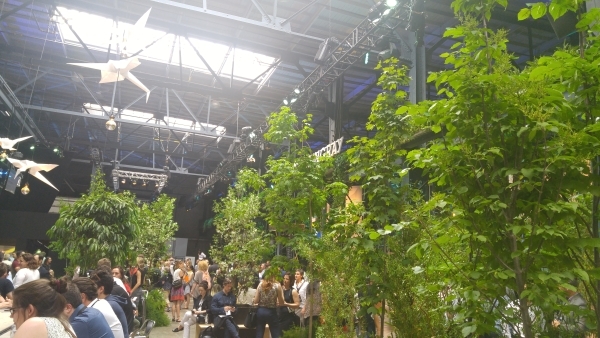 The hangar-sized building was decked out like an indoor park, with plenty of natural light and copious foliage. Like a business casual Rainforest Café, but better. 2. Cirque du Solarium. 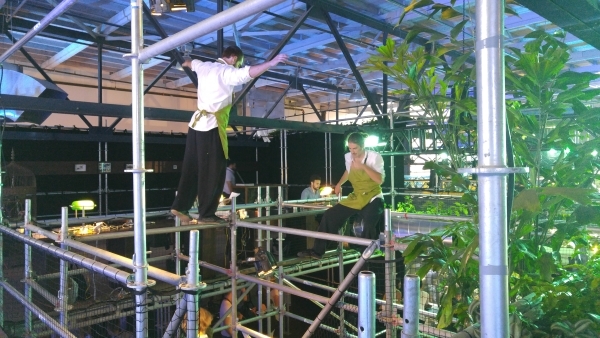 To "tend" all the flora, acrobats in gardening aprons clambered along the scaffolding and leapt across stairs, sometimes precariously close to anxious passers-by. He’s about 30 feet off the ground, but there were plenty of pointy metal bits and a wobbly staircase below to break his fall. 3. Singin’ in the Soap. 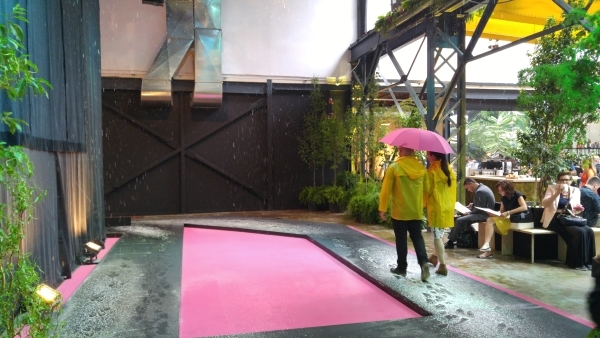 Sure, organizers said there were 1,700 Brain Dates on the first day of C2 alone, but the most relaxing way to have a conversation with a stranger was under a pink umbrella, beneath the gentle deluge of soap flakes streaming from the artificial snow machine perched high above. Even if you didn’t take a stroll, you got a little soap in your hair on the way to the biergarten, right? 4. Adult swim. No Ferris wheel this year, but the ball pit was back! Even attendees who opted for suits took the opportunity to kick back and settle in to the pool-sized basin of plastic balls. 5. On the ropes. Conference-goers who wanted a different perspective on the event could get hauled up the side of this Rube Goldberg contraption to adjust the flow of orange balls at the top. 6. Sketches by Skynet. 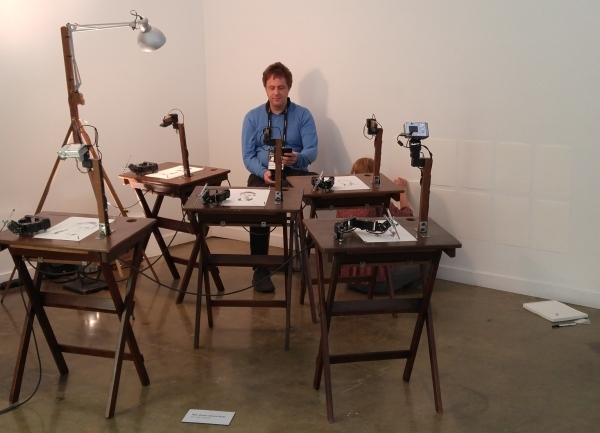 Several art installations peppered the floor of the conference, including Patrick Tresset’s "5 Robots Named Paul," which drew portraits of anyone willing to sit for the eyeless artists. 7. Causing a stir. 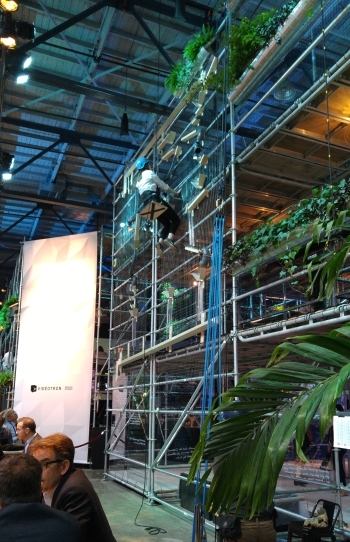 C2 Montreal was a carbon-neutral event. Real plates and silverware cut down on waste in the Hangar and the name badges were all recyclable. 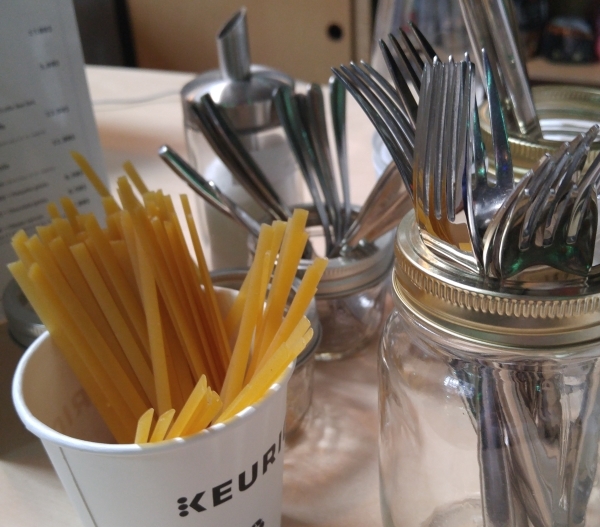 But the most unexpected green initiative was the use of half-lengths of linguine as coffee stirrers.